Next Post Lost in America – Coming to America! As always, your articles bear the hard truth that others feel afraid to mention. Great analysis of a tragic, but utterly delightful event. I thought Shem was going to murder me. I nearly died with laughter! “Oga”That commandant does not represent Nigeria at all, I want to commend the grammatical weight of your writeup but please don’t associate Oga at the top with Nigerians pls, Nigerians are intelligent. Obiora, you are on point. Write up is brilliant, but I disagree with with his analysis on some aspects about treating the white man differently, and total condemnation of Nigeria. This is the harsh truth/reality. even while laughing so I hard, I knew there were many underlying lessons to be learnt. we have a long way to go. My Oga at the top couldn’t have put it better! Kudos! This is precisely what I have been thinking. Mocking the man for his televised gaffe turned into a diversion by the twitter elite from the most serious issue of the week. What is more serious, forgetting the name of a fairly useless government website that very few people really access and blustering about it, or pardoning a robber who has stolen billions from Nigeria’s masses? I’m sure Jonathan and co. are blessing Shem for distracting those with the loudest voices away from the issues that really matter. Thanks, Pa Ikhide, for this brilliant piece. Perfectly True. Where are Nigerians? Biko go and watch “hard talk” on the bbc. If there is anything this country needs, its precisely this kind of journalism. Next time they will give the post of PRO to someone who is suitably qualified. It almost comes across as though you didn’t watch the whole interview, the journalists asked questions that were pertinent to the issue that was necessary to bring up- why Channels TV viewers kept on being misdirected to scam websites and what the agency was doing to tackle this. From what I watched, it wasn’t this ‘lynching’ you refer to and once they asked a couple times, other than the “That’s amazing” statement, they moved on. My “Oga at the top” Ikhide, before I watched the clip, I had worried that the Channels team may indeed have ‘lynched’ the Commandant. After watching it, I don’t think they did. The issue at stake had to do with a recruitment scam where potential employees were being fleeced at some website. ‘Commandant’ could have easily ducked the question but he didn’t. My take is the Channels team were as surprised as everybody else the way he went about it. I ignored the clip for many days, regarding it as the usual frivolity that somehow manages to ‘catch fire’ while important stuff barely registers with our people. But see what’s happening now: Serious people like yourself and the likes of Ken Amaeshi are writing about “Oga at the top” albeit from a very different tangent. The important thing for us all, I think, is that there is the recognition of something being broken. Perhaps, perhaps, after we’ve all finished laughing, we can start looking for ways to fix the embarrassment that is now our country. Truly, ‘Oga on Top’ syndrome is a sickening mirror of our nation. In the throes of pain that we all feel we often need a therapeutic release and that’s what Shem Obaifaiye has given to Nigerians in the past week. Oga at the Top is now claiming that he was not suspended and his wife went to Channels TV to protest according to Linda Ikeji’s blog. 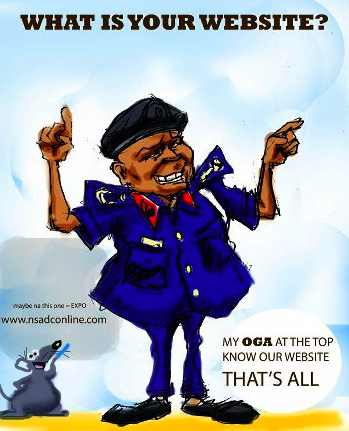 Maybe the comedy of Oga at the Top (Part 2) has just begun. Ha ha ha! If the interview is viewed from the context of Shem coming to clear confusion on an online NSCDC employment scam, then I think it would be hard to say the man was lynched or that the Channels crew was unprofessional. I humbly disagree that it was unprofessional for the journalists to “badger” Oga Shem into giving an answer to the website question. Up until he gave his “answer,” I wasn’t sure what his motivation for not giving a straightforward answer was and they helped me answer that without a shadow of a doubt. That was their job and they did it. They could have and should have done away with the sarcastic “that’s amazing” comment after, but I’m willing to forgive that. Now, earlier in the interview when he was asked what was being done about the fake web outlets that were defrauding job seekers, and he gave an answer — a talking-points answer, but an answer nonetheless — the interviewer most closely seated to him said categorically “that’s not enough!” Twice! thought THAT was extremely unprofessional. It was their job to ask the questions that would help their viewers draw their own conclusions, but not to actually make those conclusions for the viewer. However, I don’t think the Channels TV hosts were unprofessional at all in their handling of the interview. I felt they remained calm throughout the interview, and even when they repeated the questions, they made it clear that it was for the benefit of viewers who would be watching. When the Commandant was trying to bluff his way out of the “what’s your website” question, the lady even clarified by saying they wanted to know the general website and not the one for employment. I don’t think it’s the job of journalists or interviewers to cover up the ignorance of a guest on the show. Rather, the guest should have come prepared for the questions that are likely to be asked. From the discussion, it was obvious they were talking about fraudulent recruitment websites. 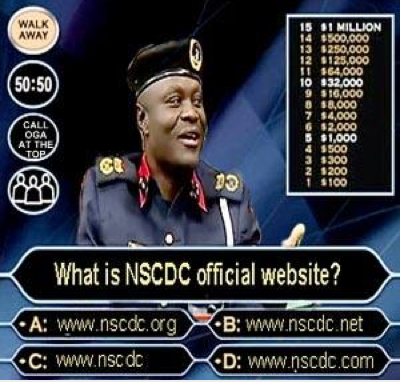 I would imagine that if a representative of the NSCDC was coming on air to talk about the recruitment websites, shouldn’t they have sent somebody who knew what a website is? I suspect they didn’t take the issues seriously at all, so they just sent someone who ranks highly but had nothing intelligent to say. Anyway the whole sorry mess has exposed us to the levels of ignorance, laziness and unprofessionalism at the top of our civil services. The question now is: will our leaders learn from this? Will they start taking their roles seriously? Will they start training their staff properly so that they can keep up with technology and communication? Will they realise that we now live in a world where people are actually expected to be good at their jobs?Time will tell. I can’t say how relieved and vindicated I am with this piece. May God reward you for saying exactly what I was thinking and bringing to fore the shortcomings of the host. As a broadcaster you don’t badger a guest rather when you find out that he is in murky waters, you guide him. Help him navigate. But alas those chanels guys felt it was okay to draw blood and in the process brought them selves to ridicule. It is really sad but shows that the host were unprepared for the show. I am left shame-faced, my tail between my legs so to speak, because like most Nigerian people, I initially could not see the wood for the trees; I didn’t see the other side of the story like you have so aptly and concisely presented it, written with such skillful craftsmanship! Well written, very well written. I now stand thoroughly chastised. Nigeria we hail thee!